This one was the first I saw and really rocked my world. Basically she presented a case study for doing all the content architecture, revisions, and organization INSIDE WORDPRESS!? Information architecture is one of my favorite parts of the process and I loved all of the tools and ideas that she presented so much that I plan to try it out on a project that I am just starting. Using some plugins which enable us to categorize content as needing revision, redundant, stale/outdated, etc we can sort through content where it lives instead of recreating a false file structure in Word or a mammoth spreadsheet that no one cares to look at let alone actually digest and approve. Clients get trained on the WordPress CMS from day one while they review, approve, and modify their content. Native capabilities provide for rapid prototyping and enable us to SHOW the client options for the homepage, sidebar, footer and other elements. Menus and site structure can easily change in the drag and drop menu maker. Clients focus on content first, then organization, then design (as it should be). Once I find her slides, Ill try to post a list of the plugins she used. This was more of an inspirational talk which was effective. He talked about the future of theme, themers, and democratizing the web. His goal to bring beauty to many lives and create designs which please, surprise, and delight all in an open source “yes, you can use it as long as when someone asks you, you say yes” ethos was refreshing. Some themes he pointed out were shelf, whitelight, and forefront. I especially liked his discussion of “this young time” in theme development. She had a friend stand on stage waving, then she put a strap with a hook on her arm and modified her wave with an Action function making her friend say “hi” while she waved. Next she hung a Filter function from her friends arm changing the wave so that the fingers wiggled. That was cool and I told her so. 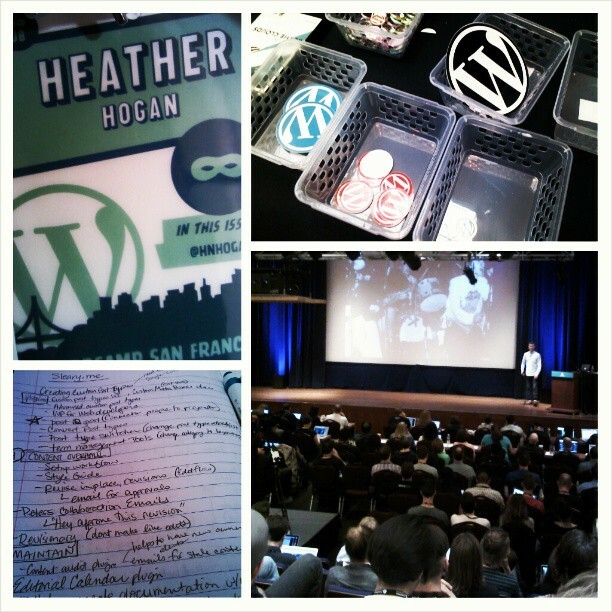 She also mentioned WordPress.TV which, sadly, had not been on my radar. His talk was hilarious and awesome. Both funny, entertaining, and packed with great tips; you can check out his slides but you wont see/learn how truly awesome the marquee tag is. What a great case study! He actually made me understand why some folks like to work on the same website/internal client for a living. He gets to come up with all kinds of cool applications for a constant flow of new content. I will check out The Washington Post. I will install and try P2 on my next project (and then o2 once its released). I think there were 7, but I only wrote 4 down. I got to pick Grants brain a bit later. He is a very smart guy. Its fun to have a leader who comes off so human, humble, and funny. He gave a great talk to a packed house. Good new things are coming! Basically, teams are more powerful than individuals. Network to find folks that complement your skills and fill in the areas that you don’t do well or don’t enjoy. She mentioned a good article I love doing free work by Megan Gray. First up, Helen is the first female developer contributor to WordPress core, which is both great and sad. I’m trying to point out all of the great and powerful women in this world to my daughter and I may need to start a blog category on women doing their thing… but that’s another post. Helen showed some rad customization’s, ney tailoring of the WordPress admin area to make the site easier for the editors to use. Great stuff that I will need to try. She has some code on github and mentioned a plugin called chosen. This was the last talk I was able to stay for and it was pretty great. Some great insight from an all male panel… why dont we have more women businesses? Are they out there? Why don’t I start one? Hmmm. Where did you find time to do all this? I was toast at the end of each day. Nicely done. I have no idea! But it was a day or so after the conference. I had to get some of it out of my head!